Be the first to share your favorite memory, photo or story of Helmond "Chuck". This memorial page is dedicated for family, friends and future generations to celebrate the life of their loved one. KUHN, Helmond "Chuck"... Passed away peacefully at Belleville General Hospital on Thursday, April 4th, 2019 at the age of 85. 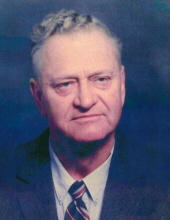 Beloved husband of Sharon Kuhn (née Caldwell). Awesome father to Gerry, Kevin (Rita Flanagan) and Sherri-Lynn Carney (Gary). Proud and loving grandfather of Maddison Kuhn, Donovan Kuhn (April Noland), Shannon Kuhn (Dylan Backland), Rebekah Hutchinson (Josh), Devon Carney and great grandfather of Chloe Kehoe. Cherished son of the late Adolph & Olga Kuhn. Brother of Malvin Kuhn (Christine), Garry Kuhn (late Debbie Giberson) and the late Kenneth Kuhn (Doreen). Brother-in-law of Jackie Nezezon (late Joseph) and Errol Caldwell (Helene). Chuck will be truly missed by nieces, nephews, extended family and many friends. Family and friends are invited to visit at WEAVER Life Centre - East, 29 Bay St. Trenton on Saturday, April 20th, 2019 from 12 - 1 PM. A celebration of Chuck's life will take place at 1 PM. Reception to follow. Keeping with his wishes, cremation has taken place. In lieu of flowers, a donation may be made to the Quinte Health Care Corporation or the Trenton Memorial Hospital Foundation. "Email Address" would like to share the life celebration of Helmond "Chuck" Kuhn. Click on the "link" to go to share a favorite memory or leave a condolence message for the family.